Diversity and distribution pattern of ammonia-oxidizing archaea (AOA) were studied across a salinity gradient in the water column of Cochin Estuary (CE), a tropical monsoonal estuary along the southeast Arabian Sea. The water column of CE was found to be nutrient rich with high bacterial (3.7–6.7 × 108 cells L−1) and archaeal abundance (1.9–4.5 × 108 cells L−1). Diversity and seasonal variation in the distribution pattern of AOA were studied using clone library analysis and Denaturing gradient gel electrophoresis (DGGE). Clone library analysis of both the amoA and 16S rRNA gene sequences showed similar diversity pattern, however the diversity was more clear when the 16S rRNA gene sequences were analyzed. More than 70% of the sequences retrieved were clustered under uncultured Thaumarchaeota group 1 lineage and the major fractions of the remaining sequences were grouped into the Nitrosopumilus lineage and Nitrosopelagicus lineage. The AOA community in the CE was less adaptable to changing environmental conditions and its distribution showed seasonal variations within the DGGE banding pattern with higher diversity during the pre-monsoon period. The distribution of AOA also showed its preference to intermediate salinity for their higher diversity. Summer monsoon associated runoff and flushing played a critical role in regulating the seasonality of AOA distribution. 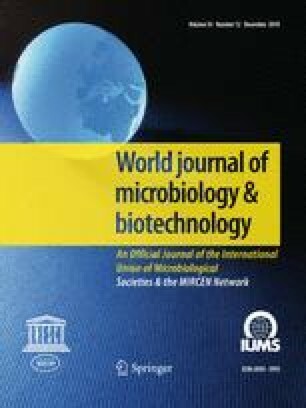 The online version of this article ( https://doi.org/10.1007/s11274-018-2570-0) contains supplementary material, which is available to authorized users. We are thankful to the Director, CSIR-National Institute of Oceanography (NIO), Goa, the Scientist-in-charge, CSIR-NIO, RC-Kochi and the Head, Department of Marine Biology, Microbiology and Biochemistry, Cochin University of Science and Technology for providing necessary facilities to carry out the work. The authors are grateful to COMAPS-ICMAM project and Centre for Marine Living Resources and Ecology, Ministry of Earth Sciences, Govt. of India for financial and technical support. The authors express their gratitude to Dr. C.T. Achuthankutty, Chief Scientist (Retired), CSIR-National Institute of Oceanography, Goa for critically reading the manuscript and improving its presentation.